Here is a view of JXN 46, RT1081 1018 (see below) in full London Country NBC livery. She’s on parade in the Weymouth rally on 1 July 1979. She dates from 1948 and has a Weymann H56R body. At the time of the photograph, she was still in service – mainly on training duties – but is now preserved. I have been privileged to drive for a number of years for Peter Cartwright and Amersham & District on their running days. 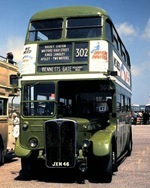 The Watford – Hemel section of the 302 has featured regularly for the annual August Hemel Running Day. March 30 sees the first Watford event. I’m hoping to be driving in the afternoon. Say hello if you’re there. Think you’ll find that JXN 46 is RT1018 not 1081. Used to drive it when I worked out of Tring in the early ’70s. It used to belong to Mike Lloyd of Wigan. Not sure if he’s still got it. It is indeed RT 1018, not 1081. I bought it in September 1981, and yes, I do indeed still have it. 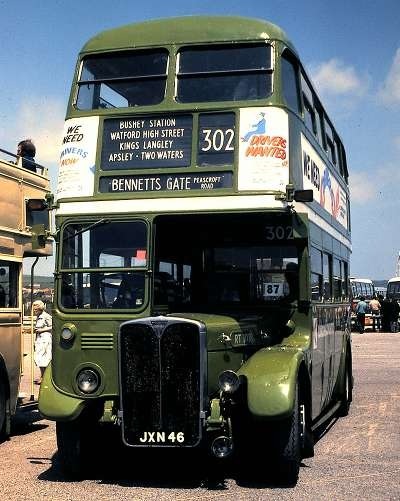 That photo was taken at Weymouth Bus Rally 1st July 1979. 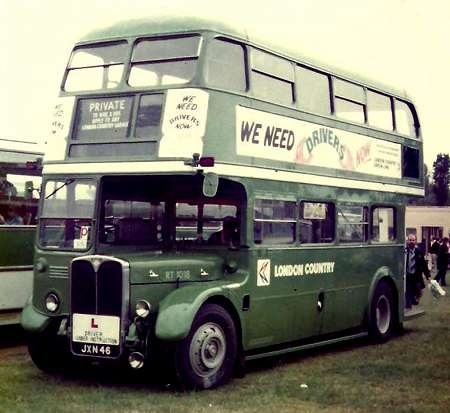 This was the bus’s first-ever rally and it was still owned by LCBS at the time. We rallied it from Hemel Hempstead Garage for a couple of years, then when it was withdrawn, I bought it. Of course, I didn’t live in Wigan in those days. It is currently having a bit of re-restoration, which it is entitled to after 32 years in preservation. Hi Mike. Pleased to know you’ve still got 1018. Can you tell me if you’re going to rally her again after her re-restoration. If so ,where? Love to see her again after all these years. Seems we’ve all moved north as I’m in Crewe now. Appologizz for the triping eeroar! I must check more carefully in future. I was just doing a bit of research on this bus, my late father Barry Neave was pictured with it sometime back in the 80’s I believe. Was just really interested in where it was and what it was doing, is it still being restored? I don’t visit this page often, so sorry for delayed reply to Keith. When she is back on the road I shall certainly take her to rallies now and then; however, restoration is proving long-drawn-out because of time constraints so I can’t say when it will be. The bus is kept at the North West Museum of Road Transport at St Helens these days but is not on display, obviously, because it’s in the workshops. Celina – very sorry to hear that Barry is now "the late." He was a part-time driving instructor at Hemel Hempstead and RT 1018 was "his" bus for that purpose. He was a great help, visiting other bus garages and scrounging spare parts for the bus, some of which I still have. I have loads of pics of the bus working as a trainer, but not sure if Barry is in any of them because normally he would be sitting in the saloon giving advice and instruction to the driver, so you couldn’t see him in photos. I may possibly have one of him at a rally somewhere, although he didn’t always accompany us. See above for where the bus is now, and yes, it is still under restoration – mainly things I had not restored previously, of course. Rest assured, she’s in good hands. I wouldn’t part with her for anything, having known her since 1959. Thank you so much for the reply Mike it meant a lot to hear some more information about dad and the busses, it was his life. 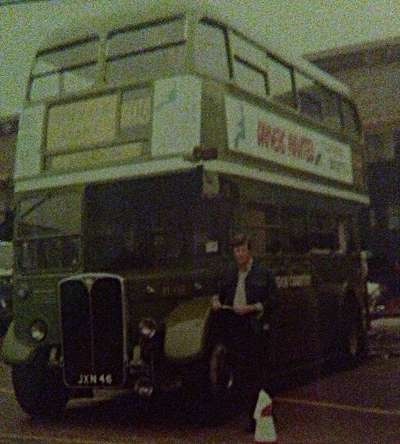 If you did have any pictures of dad with the bus they would be more than gratefully received, my mum Gloria had the picture we have as I think she accompanied dad on the rally? I’d love to come and see the bus, or maybe when it’s on rally again. Thank you so much again. Looking at this posting of RT 1018 sent me scurrying to an old photo album where I found this photo taken in the yard beside Victoria Garage [GM] round about 1950/51 when this RT had worked a relief Green Line in from St.Albans. I cannot swear to it being 1018, it could be 1013 as the writing on the back has faded plus I am standing in front of the number plate but thought it might be of interest. This is the picture I have of dad with the bus. Here is a photo I took of RT1018 possibly at a Cobham rally in the 90’s. Re the photo taken of the RT at Victoria (GM) Garage Yard around 1950/51. 04/11/14 – 17:21 posted above by Graham Crockett. It would be RT 1013 as the batch RT 1005-RT 1014 were allocated from new to St Albans (SA) RT 1005-RT 1011 had roof route boxes whereas RT 1012-RT 1014 had the route number box in the lower down position. I was living in Albans at that time. Picture taken of RT 1018 in 1980 at possibly Southend Rally. Your dad was a well respected by all. When I first started at Two Waters he was helpful to me and I have never forgotten that. I also remember 1018 from it`s days at Tring in the 70`s. I was there until it closed in `77, then went to Amersham. I may be wrong, but I seem to remember we had an RT that had an RF type steering wheel, and I think it was 1018. I also remember David Jenkins, especially when he was made up to inspector. If there was an RT with an RF steering wheel it certainly wasn’t 1018. 1018 returned to Hemel as a training bus and had an RT wheel, which of course she still does. I do not think you could actually fit an RF steering wheel to an RT as the columns are different. I remember David Jenkins, too. Sorry to say I have not so far found any pics of Barry Neave with the bus, although it was his regular vehicle. I’ll keep looking. Was it not one of the 34 that were sold onto LT and ended up in Norbiton Garage for the 65 till RT’s ended on 16th Oct 1975? Maybe I am confused with the passage of time. No, it most certainly did not pass to LT. It was the first LCBS RT to be overhauled and painted into NBC green, at which time it worked from Chelsham. There were four others, two training buses (subsequently scrapped) and RTs 604 and 3461, also now preserved. 1018 was also the only one to receive a repaint into NBC green, but now it is back in its proper livery – Lincoln green. Happy memories of RT 1018 at rallies in the 80’s Woburn showbus etc. I hope all of the Lloyds and 1018 keeping well? Might have to pay a visit if at St Helens as mentioned in previous comments. Hello Mark, didn’t see your comment until just now as I don’t visit this page very often. Yes thanks, we are all well, although the RT is in need of skilled surgery to her nearside lower deck after 37 years in preservation. I am getting on with this as time permits and she is getting better slowly. She is still in the museum at St Helens, but not on display as she is in the workshop which is not open to the public for reasons of safety. If you do come, check first that we are open (we close after Christmas until February for cleaning, maintenance and the like. If you visit on a Sunday I shall be there and I can take you up to see the workshop and the bus. It’s a long time since she was at Woburn or anywhere else for that matter, having been stored now for many years. You can almost smell the workshop in this view! This ex-London Transport Regent RT came to East Midland with the take-over of Wass, Mansfield in April 1958. 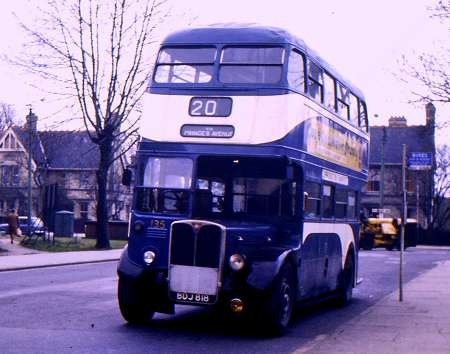 D47 was gone in 1960 – to A1 Service, Ardrossan. Nice view, Les, and thank you for posting. I note that East Midland acquired this vehicle as part of the deal in buying Wass, but what did London Transport deem to be so "non standard" about Cravens and Saro bodies that they were sold out of the fleet so quickly? Splendid picture, there’s something altogether fascinating about views of buses undergoing repair or maintenance. Makes me want to go and brew a pot of extra strength ‘busman’s’ tea! What a pity KGK 750 didn’t make it into the East Midland fleet until after they’d switched over to the maroon livery, it would have looked a treat in the old biscuit, chocolate and cream scheme. The Cravens RTs were totally non standard with 5 bay construction. 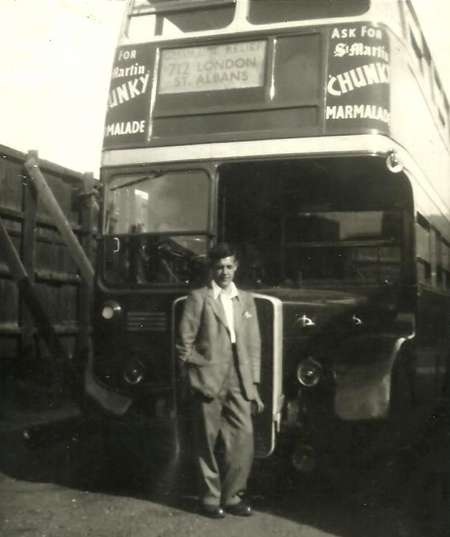 Not only were the body spares, particularly glass spares, non standard, the vehicles could not be processed through Aldenham works where body and chassis swaps were the rule, unless they were swapped with other Cravens bodied vehicles due to the way the bodies were mounted. As this did not fit the, by mid 1950s, maintenance regime the Cravens vehicles were sold off. In any event they had been a stop gap to cover delivery delays at Park Royal and Weymann. The SARO vehicles were much more standard but there were enough differences to make them cuckoos in what was very much a Park Royal/Weymann nest. The Cravens bodies were not to London Transport design but used the standard Cravens shell with London Transport features. Most noticeably they were of five-bay construction rather than four. I wasn’t aware that the Saunders bodies were short-lived, and Ian’s Bus Stop site www.countrybus.org/RT/RT3s.htm says they weren’t. Five bay construction whilst all other RT family members were four bay, perhaps? Pete, the Craven-bodied RT’s were merely Craven’s standard fare modified to look something like standard RT bodies. The fronts were flatter (I preferred them), they had five-bays and the back curved, hunch-backed, above the rear platform window, itself less wide and offset to the offside. The rear number plate was also further to the right. They were not jig-built and useless for standard Aldernham overhauls. I’m not so sure that the SaRo versions had shorter lives with LTE; they were entirely standard in all respects, to my knowledge. I’ve done a little more digging, Pete, about the SaRo bodies. They were strong and fully compatible with RT bodies from the usual suppliers, although they had slight weakness with the front bulkhead, corrected at first overhaul. The only reason they were withdrawn a little earlier than others was because they had front roofboxes. Nevertheless, some lasted a full 20 years,albeit as learner vehciles latterly. Chris, were the SARO bodies exchanged in the normal way in the Aldenham programme? As top box bodies were considered non standard from the mid 1950s I was under the impression that they weren’t after first overhaul, to avoid non standard bodies being mated with the newer chassis. Thanks for your responses, gents. I knew someone would be able to clarify! Although I’ve always been a fervent admirer of the wonderful standard RT (and RTL/RTW), both as a passenger and as a driver, I have equal enthusiasm for the fascinating Cravens version also. The five bay appearance fits in very well with the general handsome RT profile, and the various other smaller differences add to the individual appeal of "The Cravens." As far as I’m aware the only difference from standard in the appearance of the Saro bodies was the position of the offside route stencil frame – oh and, once in a lifetime, the need to reduce the tyre pressures/height in order to "escape" from Anglesey under the portals of the Menai Straits bridge. It would be interesting to know which depot this was, I would say either Mansfield or Worksop. Wass Brothers operated a busy service from Mansfield to Clipstone, Edwinstowe and Ollerton, they bought three of these Craven RT’s in 1957, the others were JXC 219 and KGK 739, their livery was half maroon and half dark red and it’s difficult to tell from the picture if East Midland repainted them when Wass had only painted them a year earlier, or if they simply added a cream band. The destination box was certainly altered by East Midland, Wass had retained the LT style boxes and had painted their name in the bottom aperture. It seems a shame that these fine vehicles were disposed of by East Midland after just two years when only eleven years old but by 1960 they were taking large numbers of Atlanteans. This photo was taken in the old fitting shops at Worksop depot. The three of these ended their lives on Worksop town services. This was due to them being high bridge. Bradford City Transport had 2 Saunders RTs in the batch of 25 bought from Birds dealer in 1958 Numbered 411 and 421 they lasted until 1968 with the odd spell stored in the TIN SHED at Thornbury. I concur completely with your view of London Transport extravagance, Neville, and have made similar comments on this forum in the past. I joined LT(CB&C) at Reigate in a clerical capacity from school after ‘A’ Levels in August 1960, and was astounded at the curious attitude that prevailed throughout the organisation at every level. It was like being on a different planet, totally insulated from all outside influences. It was incapable of learning from others in the bus industry since it believed that London operating conditions were unique – its own experience therefore existed on a far higher plane than that of "provincial" people. Thus it made expensive mistakes that could have been mitigated by contacts outside its own closed mentality. The engineering system was typical of its centralised attitudes and slavish devotion to standardisation. The RT family (once those nasty, interloping Cravens and Saunders machines were removed), the RFs and the RMs were all designed, like Meccano, to be taken to pieces. Defective pieces could then be removed at garages and sent to Chiswick or Aldenham, and reconditioned parts installed in replacement. No proper analytical engineering expertise was required at garage level. The front line mechanical operation was maintained by fitters, not by engineers. Whatever the fault, major or minor, a replacement part was almost always seen as the solution. Another LT vehicle class that epitomised the cavalier approach to costs was the RC and the allied EC of BEA that LT ‘looked after’. Yes, the wet liner engines of the Reliance did give trouble, but swathes of British bus operators ran them successfully for years. The LT/BEA fleets spent much of their time in store and were disposed of after very short lives. Remarkably, the insular attitude of London’s public transport "experts" remains today, as may be seen in Boris Johnson’s preposterous, extravagant, ego inflating "Routemaster". After their inevitably limited life in London, I don’t see many takers for those things on the secondhand market unless they are extremely cheap. The destination looks like Langold, which I think was a mining village near Worksop. As for your comment, Neville, about LTE’s disposal policy, I’m the first one to wonder why! Firstly, this policy did not extend across the whole of LTE. Non-standard trolleybuses, and there were several of them, led almost full lives alongside their compatratriots and I recall, when living in London, several Tube and sub- surface stock ‘non-standard’ carriages also with their ‘standard’ compatriots. The bus division certainly disliked non-standard vehicles and I even recall a very-sloping front-ended STL which, late in life, was rebuilt, all for the sake of four seats! A whole lot of already non-standard lowbridge green ST’s were tweaked such that not one of them looked the same in the end. 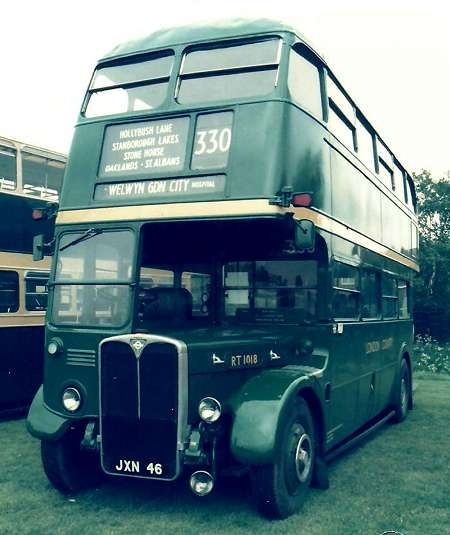 TF1, with non-standard body, was altered to look marginally like its compatriots, then disposed of in 1946, along with various other non-standard types, like the double-deck Q’s at the very time when it was obvious they were needed! However, with the RT family of buses, peak passenger numbers were in 1949, although the dwindling numbers were slow to start with. Typically, LTE definitely over-ordered them to the point where the last 400 went into store for about four years and many of them had ex-SRT bodies draped on them until they eventually went into service. LPTB/LTE achieved some remarkable things in its short life, especially pre-war, but it was quite barmy in some ways and you won’t find me an apologist for it! And Chris Y, I never realised they had to lower the RT’s tyre pressures to get them off Anglesey, presumably after that first accident! Chris H – some most interesting insights into LPTB/LTE policy and practice. I hope I wasn’t imagining the necessity to lower the Saro RTs for their journey from the factory, but I’m sure that I read it somewhere reliable. I’d never considered the feature of roof route number boxes on RTLs but having looked at these pictures I’ve quickly decided that I liked them, and on the RTs too. I think they gave just a little "look of determination" to the otherwise curvaceous and attractive fronts. On a practical level too I’m sure that the all important route number was more easily seen by intending passengers in heavy traffic – perhaps though there were risks of damage and leakage from incidents in mechanical washing machines, although none seems evident in photographs. Well, Chris, Neville, Roger and Chris. Been away and just read your theses on London Transport. Can add little other than whole hearted agreement. Look no further than the premature withdrawals all having longer (happy) lives with a second (major) operator than with LT – including the not particularly happy Swift/Merlin fleet in Malta. As a Sheffielder, I will always have a soft spot for the Cravens. Chris H, my first visit to London from up North was as an 8 year old in 1955. The roof box fascinated me and, over the years and on many visits into the 1960s, I managed a few rides on roof box RTLs. Chris Y, you aren’t suffering from excess imagination as the reduction in tyre pressures has been documented in a few publications over many years. Given the longevity of the tale and the fact |I’ve never seen it contradicted, it may well be true. Just to finish our deviation, there were a few body oddities with LPTB I never mentioned. Several ‘pre-war’ RT’s were fitted, post-war, with quarter opening front windows, for an experiment, I assume. One of them had its front roofbox altered for them by an errant tree, the former never being replaced. This reminds me that LPTB, in 1942, were authorised to build some semi-austerity bodies to STL style, to be fitted to unfrozen Regent I chassis. In the event, only three were so fitted, the rest going onto used chassis. The highbridge versions all had the roofbox fronts, but minus the roofboxes. The rest of the highbridges had a mix of ‘float’ boxes some back to 1932. They all had crash boxes and sensibly went to hilly parts of Country Area. These highly non-standard, semi-austerity vehicles lasted until the very end of STL operation, me catching my only ever glimpse of one (re-painted green by then) as a garage ‘hack’, in mid-1955, within days of withdrawal. So, sometimes, non-standard was valued! An interesting aside to Les’s posting is that Wass Brothers were an apparently well respected independent and although it is now fifty five years since they sold out to East Midland, their garage and premises on Westfield Lane, Mansfield survive to this day in their entirety and are now used by another well known independent, Johnson Bros/Redfern Travel. Just wondered if anyone has any details of the years of Wass ownership re the Ex Lincoln Corporation Leyland Titan TD4. Did they have two? Presumably the RTs replaced them, Any info will be most welcome. Wass Bros Mansfield. Regarding the depot comment by Chris Barker. I wonder Chris, perhaps you are mixing up the locations here? I live in the district and I’m frustrated at how little history from the 20’s to the 70’s was recorded. As such I’m not saying you’re mistaken but my understanding is that the Wass Bros depot was about half a mile further up Westfield Lane, at the junction with Redgate Street. They (WB) did have an ‘office/house/HQ’ on Welbeck Street in Mansfield but I’ve no evidence that they occupied the Lindley Street Garage used by Redferns for some 30 odd years. Research suggests that The Lindley Street depot was a late 20’s extension to the original Neville & Sons Motor Garage on Westfield Lane. George Neville was a pre WWI Mail Carrier and operated the first omnibuses in Mansfield, his business expanded into wagon building and adaptations and moved to a larger site just before WWII. The body building company still exists in the town today, although owned by some foreign multi-national. The Westfield Lane/Lindley St site then seems to have passed to existing Lindley Street haulier Tom Eason, who must have been attracted to the bigger garage just down his street! He rapidly developed his business into specialist carrier, Westfield Transport Ltd. They moved to a purpose built site in 1958 before being taken over by Pickfords in 1964. The Garages were then occupied by another haulier, W.T.Kemp, by the 70’s his sons were operating the site as a Saab and DAF cars dealership. Redferns moved into the Lindley Street Garage in 1975. It was 5 years before the Wass Bros depot site was re-developed with the building of a pub known the The Redgates. I’ve never seen any picture taken in or around the depot so if anyone would care to share? I do however have a picture of JXC 219, still in Wass 2 tone red but with East Midland decals. It is photographed with serious front dome damage, seemingly having tried to pass under a bridge some 3 or 4 inches too low. Amazingly none of the glass in the upper deck looks to have failed, well built those Cravens bodies? There does seem to have been 2 ex-Lincoln TD4’s in the fleet, VL 8847-8. Listed with Wass from June 1952 till April 1956. Berisford, I’m sure you’re correct in what you say. I do have one or two pictures of Wass vehicles which I took with me to Mansfield a few years ago to try and identify the site, which I thought I had but unfortunately I didn’t know about the premises further up Westfield lane. Oh well, at least some of the other operators sites, Trumans, Ebor, Red Bus and Naylors are still recognisable! 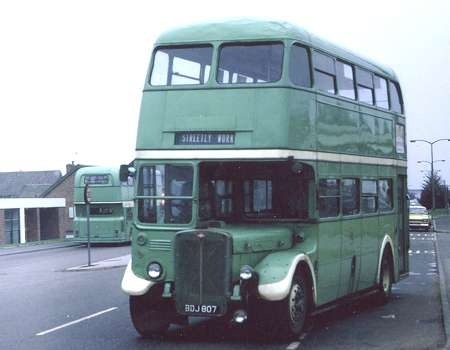 With regard to the ex-Lincoln TD4’s, there was also an ex-Chesterfield TD5, HNU 818 and it made me wonder if the three RT’s replaced the three Titans but the RT’s didn’t arrive until 1957 so were there any more second hand double deckers? I have the first 2 RT’s listed as arriving in May 56 as the 2 TD4’s leave and the 3rd RT looks to have entered service with Wass in November 56 as the Chesterfield HNU818 departs? That’s interesting, Chris, regarding ex-Chesterfield Titan HNU 818. 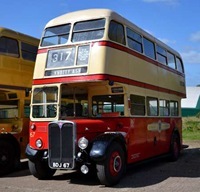 Sisters HNU 817/9/20 went to Rotherham Corporation in 1956, as a stop gap measure until three lowbridge Daimlers that the corporation had ordered could be delivered the following year. I was only young, but I recall riding on one of them one evening, on its way into town from Dinnington, and it left a lasting impression, as it was such a raucous machine. Oh dear, I feel the imminent onset of the famous "egg on the face." I’ve just looked in Ken Blacker’s splendid book about the RTs and there is a photo of a long line of the Saunders buses on the Menai Straits bridge – a portal is visible and there appears to be plenty of headroom, so I don’t know what to make of the tale about reducing tyre pressures – perhaps someone once made a "tongue in cheek remark" ?? Chris, don’t be embarrassed. As I said before, that tale about tyre pressures has been around a long time. I remember having first read it whilst still at school, and I left school in 1965. Wass’s service was a busy one which needed quite a bit of duplication and it would seem that there were six double deckers in the fleet at any one time, three bought new, a PD1/Burlingham, a Crossley/Willowbrook and an all Leyland PD2. The second hand ones as detailed, three pre-war Titans replaced by the three RT’s. The ones purchased new were all lowbridge and yet the service didn’t appear to require lowbridge buses. There was also a nice Willowbrook bodied PS1 saloon. Beresford the comments on Wass Bros depot on Newgate Lane. I have seen photos of No 12 (D48) in the yard this was a single deck building at the side, The photo is one of R H G Simpson collection. Don’t know if they are still available. The other gent on about tyre. 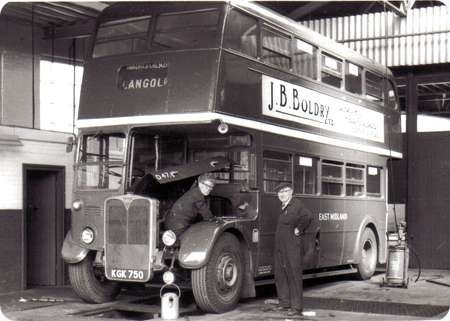 London fitted 36×8 tyres and wheels to gain bridge clearance, I Know We fitted a High bridge bus and found it suitable. The out come was it Took a Long time for Sheffield to catch on. Just wondered also which dealer supplied the Wass Cravens RTs ? I thought these were withdrawn by LT in 1954 or am I wrong ? Steve, according to the PSV Circle fleet history of East Midland, the RT’s were acquired by Wass via Bird’s of Stratford-on-Avon in 1957. Thank you Chris ! Appreciate this. Chris Barker, I wonder, have you got an erroneous/alternative copy of the East Midland PSV fleet list? My edition of PE13 and ‘Ians Bus Stop’ site clearly show the RT’s as acquired in 1956, with the PE13 even showing, with the help of local authority licence date, the May & November 1956 dates for the Wass Bros double decker in-out/swap overs! Ian’s Bus Stop shows KGK 750, RT 1491, being acquired by Wass in November 1956. RT 1456, JXC 219, and RT 1480, KGK 739, are also listed as arriving with Wass in 1956, but the actual month in both cases is uncertain. Berisford, my copy of the East Midland fleet history is undated but bears the number PB1, current until 1963 with addenda for 1966 and 1968 so perhaps it is a little erroneous! I have had a look on the ‘Ian’s Bus Stop’ site which I didn’t know about and I agree with you that the dates are obviously correct and account for the withdrawal of the Titans.